Translator: English to Brazilian Portuguese. Qualified member of the ITI in the UK. Member of ATA's medical division. 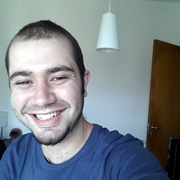 I'm a Brazilian translator specializing in medical and life sciences. I have over 10 years of translation experience, and an educational background carefully tailored for translation, including fields such as biotechnology, genetics, human anatomy, and clinical trials. Other fields of professional interest and independent study include oncology, neuroscience, epidemiology, and psychiatry. I'm also used to the routines of translation agencies, having worked both as a freelancer and as an in-house translator. I'm a proficient user of CAT tools such as memoQ, Trados, and Wordfast Pro. My rates are reasonable. And I'm always 100% committed to producing translations that are highly readable, concise, and most of all scientifically accurate, putting ethics and patient safety in first place. ◦ And friendly support through a project's lifecycle, with an eye on long-term cooperation. Thanks for visiting, and please feel free to say hello any time. • Lectures and articles, especially in the fields of oncology and therapeutics. Please feel free to say hello at abner@intertexto.com.br, and I'll get back to you as soon as possible.